Interview: Sophie Kinsella, Author Of 'I Owe You One' The author of the bestselling Shopaholic series is back, with a new novel about a woman who's addicted not to shopping but to fixing the lives of the people around her — at the expense of her own. 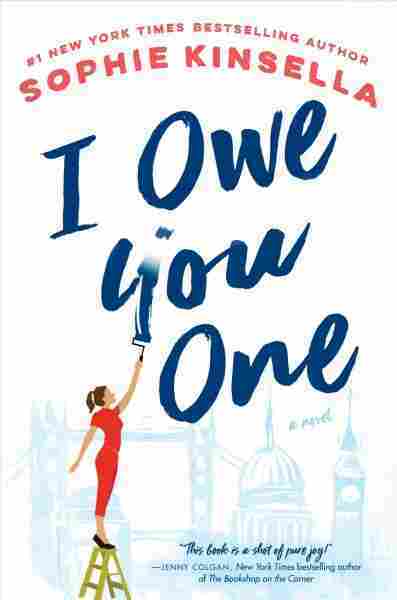 Sophie Kinsella's new novel I Owe You One centers around a family shop in London and a young woman trying to make her way in the world, and maybe even find love, while dealing with her self-centered siblings. Kinsella — a pen name for Madeleine Wickham — has sold over 40 million copies of her Shopaholic books. But this latest story is about a woman addicted not to shopping but to fixing other people's lives — often at the expense of her own. Kinsella says the character's name — Fixie Farr — "explains it all ... She's the girl who comes into your house and sees that your painting is crooked and has to straighten it." But then, a chance meeting in a coffee shop turns Fixie's life upside down. What's interesting about her is that in some of her life she is on top of it. She runs a staff at her family's store, and she's assertive, and she has great ideas — and then she gets back into her family situation and she goes to pieces, because she is slightly awestruck by her older siblings ... they've become kind of stuck in family roles. And it's interesting, but I was inspired by people that I've spoken to, and especially, I have to say, around Christmastime, when people go back to their families, and you find that they start talking in their old roles. Like they might be a really successful person but they go home and they're the little brother, or they're still resentful over that bedroom that should have been there ... I think family dynamics are choppy waters to navigate, and I wanted to give her the choppiest of waters because I always slightly torture my heroines. I just think there's something exciting about the time of life when you're on the lookout for opportunities in all directions ... everything is ahead of you. And for me, the wide-open horizon is so exciting. And I have dealt with other topics — my previous book, Surprise Me, looked at marriage and how to keep that alive. But there is something exhilarating about meeting a stranger in a coffee shop and thinking, where's this going to go? It's a kind of frisson that I love to return to. I left my job to write novels when I was 20-something, and in my head I'm pretty much still that 20-something, and looking at the grownups. I wanted to tell the story of a young woman who finds her voice, because I think there's something incredibly empowering about that, and I related to that ... so that was my kind of character. And then I love the idea of two strangers meeting. I just, there's something magical about the feeling that you're in a big city, and you go to a coffee shop, and there's a guy opposite you, and in one version you just walk away and never see him again, but in this version you become connected. Karina Pauletti and Martha Ann Overland edited this piece for radio, and Petra Mayer adapted it for the Web.